Wettability is an important feature of the solid surface, which is determined by the chemical composition and morphology of the surface. Super-hydrophilic and super hydrophobic surface characteristics are the main contents of invasive studies. The superhydrophobic (water-repellent) surface generally refers to the surface that the contact angle between water and surface is greater than 150 degrees. That people know superhydrophobic surface is mainly from plant leaves – lotus leaf surface, “self-cleaning” phenomenon. For example, water droplets can roll to roll on the surface of the lotus leaf, even if some of the sewage water pour in the leaf, it will not leave a stain on the leaves. Such unstained lotus leaf characteristics are called “self-cleaning” effect. Although people have known very early the lotus leaf surface “self-cleaning” effect, but has been unable to understand the secret of lotus leaf surface. Until the 1990s, two German scientists first observed with a scanning electron microscope, the microstructure of the lotus leaf surface, that “self-cleaning” effect is caused by a micron mastoid and lotus leaf surface wax on the surface. Thereafter, Scientists analyzed in-depth the surface of the lotus leaf micron structure and found that there is a nanostructures in the lotus leaf surface mastoid, while this dual structure of micron and nano-structure is the underlying causes of “self-cleaning” in a lotus leaf surface. For a hydrophobic solid surface, when the surface has tiny projections, some of the air would be “off to” between water and solid surfaces, leading to drops of water most of the contact with air,but the direct contact with the solid surfaces greatly decreases. Since the surface tension of water droplets in shape so that the roughened surface is close to spherical, the contact angle is up to 150 degrees, and the drops of water on the surface can be free to roll. Even with some of the dirty stuff on the surface, they will be rolling drops away, so the surface will have a “self-cleaning” capability. 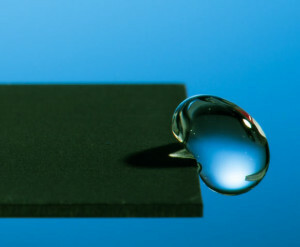 This surface with contact angle greater than 150 degrees is called “super-hydrophobic surface”, and the contact angle of the general hydrophobic surface is only greater than 90 degrees. In the natural world,except that the lotus leaf has “self-cleaning” capability ,there are others such as rice, taro plants and feathers like birds.The special significance of this “self-cleaning” effect is in addition to maintaining the surface of the cleaning, as well as for the prevention of pathogens invasion. Because even with the pathogen to the leaf surface, it will be washed away. So like this, even the lotus plant growing in a “dirty” environment is not easy to get sick, very important reason is because of this self-cleaning capability.